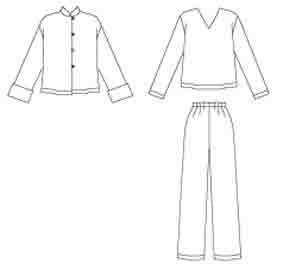 Pyjama pants are often suggested as a beginner sewing project. And continuing with the theme of comfortable and classy loungewear – what about high quality designer versions? Of course there are couture pj pants available from luxury lingerie companies – enjoy being stroked by silk charmeuse and lace. A skilled hobby sewer could make those. But definitely not fabrics for easy sewing. How about simpler than that ! 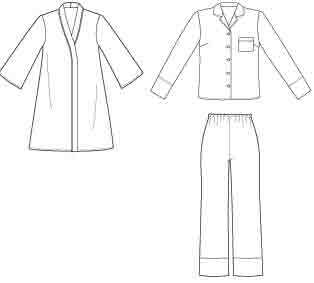 Here are some comments on pyjama patterns and sew-alongs for beginners. And on using the same skills to make simple elastic waist pants. And on the further skills needed to add a simple top. No wonder some people find it daunting to learn to sew, and need to work up to all that slowly. In 4-H sewing classes, pj pants are what children make only after a year of sewing small projects which gradually introduce all these skills. I think it’s a bit pressurised to expect all adults to be comfortable with jumping into such a project as their first item. But anyway that’s a separate topic I dealt with in my post on learning help for complete beginners. Which includes some places you can look to for help with learning all those skills. 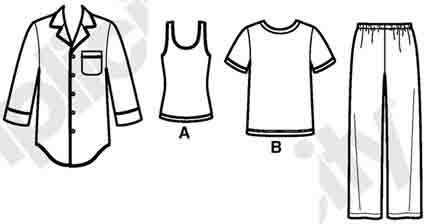 These are sew-alongs with specific instructions which give more information than in the pattern. 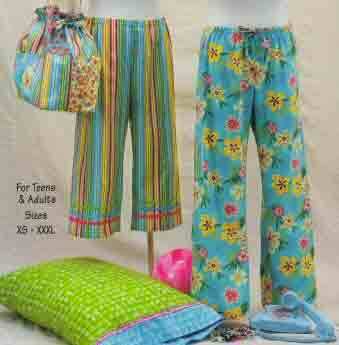 These sew-alongs use specific patterns, but the pj pant style is so general any similar pattern would do. from Did you make that. She used Simplicity 2721, now oop and replaced by Simplicity 2116. She also links to instructions for drafting your own pattern, but I find the instructions incomprehensible. Instructions in Sew What ! Fleece are much better. A bit difficult to find Did You Sew That’s sequence of sew-along posts, so here are links. There’s another pyjama pants tutorial using slightly more skills (side seams, buttonholes), from Stitch and Boots. It uses Simplicity 5314, a pattern for larger sizes. 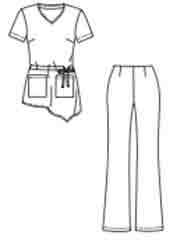 Free short video on elastic-waist pants from Simplicity patterns. see right side menu with this for many more video tutorials. Craftsy video class on making pyjama pants, pattern included (not free). from the Sewing Guru (not free). He uses Simplicity 3971, and adds fly opening for men. Similar style to above, pattern includes robe. This DVD has good sewing demos, though they don’t mention they serge the seam finishes. And the intro on what you need to know before you start sewing is poor, just talking heads. 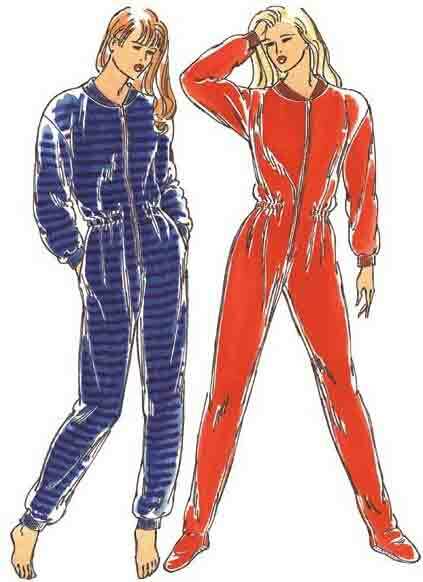 I don’t know of any designer patterns for pyjama pants, unless you count Cindy Taylor Oates’ booklets for fun styles. Start with ones without the added cuff. Multi-fabric styles, includes camp shirt pj top. P.S. 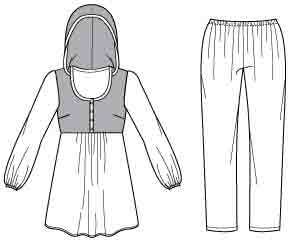 Toni-Maree has pointed out the new Sewaholic loungewear pants pattern. Here are Tasia’s comments on her pattern. And on not using contrast fabric. Preparation, including grading this pattern if you’re not pear shaped. Many extra processes, so a pattern for advanced beginners. 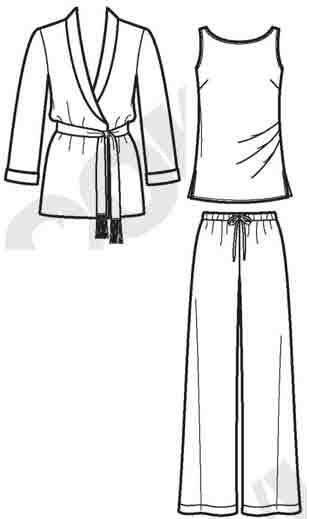 Once you’ve made a pair of pj pants, what more can you do that makes good use of the same skills ? Of course, make some elastic waist pants – just needs a slight change of fabric, and perhaps less looseness (ease) to the pattern. 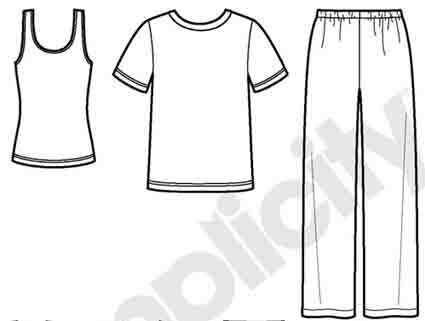 There are many many plain elastic waist pants in suit/ co-ordinate/ sportswear patterns from the major pattern companies, with tops requiring various levels of skill. I’ve just picked speed patterns. These patterns all claim to be sewable in 1 hour – means they’re simple, but don’t expect a beginner to sew that fast ! McCall’s 6568 – 3 lengths, 2 leg widths. McCall’s 5889 – oop slouch pants with wide hips, tapered legs. If you’re looking for a slimmer-leg pattern try McCall’s 6843 (not 1-hour). 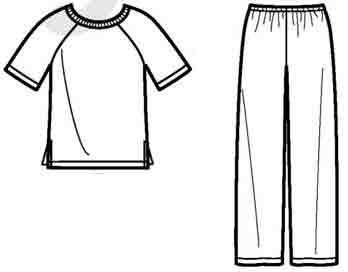 There may not be many designer pj pant patterns, but there are several for elastic waist pants. Here are a couple of examples. Her other pant patterns have more style elements. I agree with her that if you’re wearing one of those over-sized jackets, adding eye-attracting detail to the pants would both look a bit over the top and drag the eye down to look fattening. This pattern has more of a beginner top : Sewing Workshop Hudson pant. For the simplest pant sewing, leave out the ankle shaping darts. – press binding folds into shape. The Sewing Guru and Hip-Line Media pyjama video sew-alongs mentioned before show you how. sew stretch seams using the zig-zag stitch. 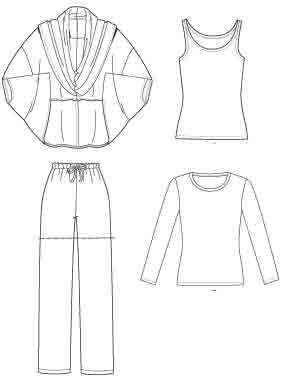 sew stretch hems using a double needle. attach rib bands to other knits. Some sources of guidance for learning these skills in my post on help for advanced beginners. And here’s my post listing sewalongs for knit tops. 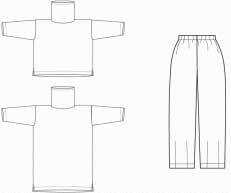 There are patterns for knit top/ camp shirt/ elastic waist skirt and pants, plus many simple variations, in Easy Sewing the Kwik Sew Way by Kerstin Martensson. 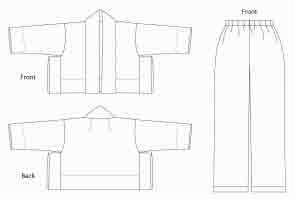 Some ‘beginner’ sewing classes start with a fitted-waist skirt with darts, zip, waistband. For a timid learner like me, those are a long way along the sequence of skills development ! Learn at the speed which is right for you to develop confidence at every step. 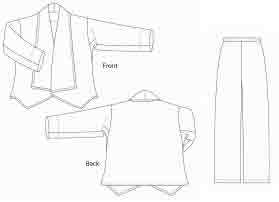 You’re getting to ‘intermediate’ level when you can sew many types of seam, seam finish, collar, sleeve, pocket, buttonhole, zip, placket, lining, embellishment. . .
Do you enjoy making and wearing elastic waist pants ? A commenter asked me to bring together the books I’ve mentioned here and there. I didn’t go through my posts to develop this list – wrote down the ones that I remembered and are easy to access on my shelves – the best test ! There are many other excellent books available. I just mention ones I’ve seen myself, and which stay in my mind and get referred to again rather than forgotten. I have of course also seen many books which range from uninspiring through inadequate to terrible – but I’m not going to use space explaining why I don’t like them. And once I’ve found a book that satisfies my needs in that area, I tend to stop looking at more. So, sorry, you won’t be able to tell, if I don’t mention something, whether I think it’s bad, or I like something else better, or I simply haven’t seen it. Even though this is only s small selection of what’s available, I’m a book person so this spread to great length. This is about books on personal style and wardrobing. Then couple of posts for books on pattern making and fit. Final post with books about sewing. Books I not only enjoyed reading a first time, but also look at again. And of course I haven’t been able to resist making lengthy comments. Style books always say they want to help you look your best. But they don’t all mean flattering your personal special features. They often mean trying to make you look more like a model. Or they assume you want to look rich and powerful. Those I try to avoid – I get upset about both their values and their advice. In fact people disagree passionately about style books – perhaps because of their personal style, or because of how much they already know about what suits them and how to build good outfits. Always worth reading the low-star reviews at Amazon. Most of the books I like have very out-of date illustrations, but the advice is still relevant. Most important – they cover a wide range of personal colourings, body shapes, and style preferences, not just fashion mag big city chic. A good short introduction on getting your best clothes (one chapter on sewing). Beautiful, fascinating, detailed. Artists love every body shape. The European off-shoot of Color Me Beautiful, with more colour types and personal styles. I prefer this to more recent books by UK CMB. Rich with interesting comments on personal style. Though his specific suggestions show he’s not so good at helping people who like to dress quietly ! For some sewers, the ultimate expression of personal style is to design our own clothes. If you’d like explore the design process, here are some possible starters. A sequence of guided exercises. You may need other books for guidance on the techniques used, but working through this is like doing a fashion design foundation course. Re-thinking your style, and need to know you have a basic wardrobe so you always have ‘something to wear’ ? I mentioned this before, on personal style. The original wardrobe planning book and still interesting. She does assume you wear a skirt to work, but it’s easy to swap pants for skirts. Just one personal style – assumes you want to dress for the top. Prestige wardrobing, I enjoy this for a good laugh. His One-Star Wardrobe (6-garment capsule plus accessories) cost about US$1900 when the book was published nearly 30 years ago (1984). The UK Retail Price Index has gone up more than 2.5 times since then. That means investing about $5000/ £3300 on a basic RTW designer starter capsule at today’s prices. Looking at Net-a-Porter for current designer RTW prices, that is actually in the low price range for top designers. From that Pante works up to a Five-Star Plan which includes furs, big diamonds, and red-carpet dresses (he doesn’t cost out that one :D). Making your own clothes could work out at a fraction of the designer RTW price (see my post comparing hobby sewing and designer RTW clothes prices). But do choose quality fabrics and accessories if you want to look like you buy from designers. Say $700+ for materials for clothes (pant suit, blazer, 2 blouses, dress), and $1300 for accessories (2 pairs shoes, bag, belt). Gets it down to about $2000 for your starter capsule. Bringing home the Birkin by Michael Tonello – on the world supported by luxury fashionistas. Fashion Babylon by Imogen Edwards-Jones – fictional life of a designer. Happy hobby sewers – we can admire inspired design and technique without getting enmeshed in all the ‘keeping up’ with fashion.